What are YOU thinking about--as you rise up, sit down, and walk along the way? What is on YOUR mind? "Those who live according to the sinful nature focus on what that nature desires. Those who, instead, live in companionship with the Spirit of Jesus have their minds totally focused on what the Spirit desires." (Rom.8:5) We are only here to love Jesus with all of our hearts, souls, minds, strength, energy, and affection. 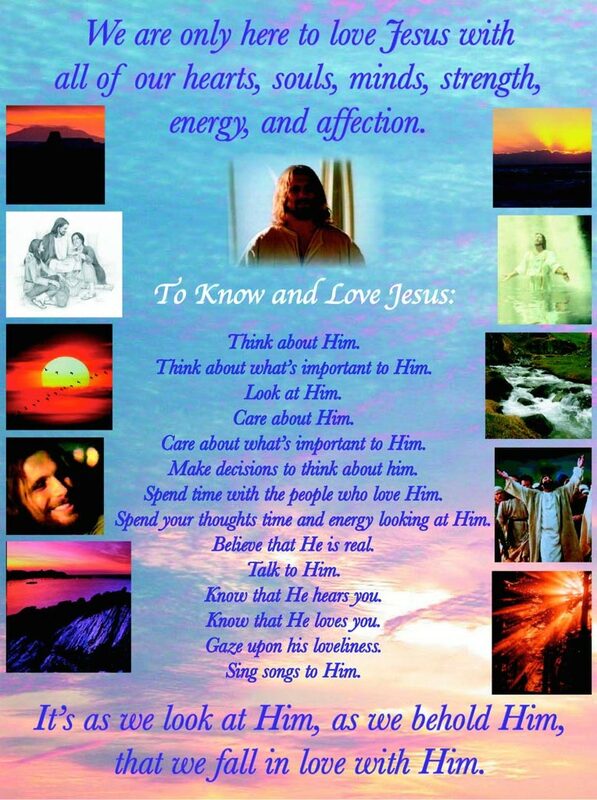 To Know and Love Jesus: Think about Him. Think about what's important to Him. Look at Him. Care about Him. Care about what's important to Him. Make decisions to think about him. Spend time with the people who love Him. Spend your thoughts time and energy looking at Him. Believe that He is real. Talk to Him. Know that He hears you. Know that He loves you. Gaze upon his loveliness. Sing songs to Him. It's as we look at Him, as we behold Him, that we fall in love with Him.